This book is so much more than the little blurb at the top of the page. It's a teeny teeny tiny blurb.From the introduction: "This book follows several dealers and collectors at the Brimfield antiques market, from May 2003 to May 2004. It is not just a tale of some very smart and resourceful buyers and sellers or of their triumphs and failures. It is a story of history, culture, and heritage and how we can rediscover values lost amid the rubble of time. "A treasure of history and information.And fun. I've been to Brimfield, MA twice and this book really gives the "feel" of what it is like to be there. Really enjoyed reading about the "beginnings" of the Brimfield Show and how the show keeps surviving after "gloomy reports" that every year may be the "last" year. 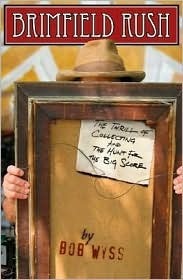 The book basically followed the lives of a few dealers and how they "win & lose" when it comes to judging what antiques or paintings are real or "fake". You really have had to "be there" to connect with this book. I've never seen anything like Brimfield. A really great experience if you are interested in antiques and/or collectibles. Confession: my cousin is the author of this book! But that didn't mean I had to like it. But I did, I really did, The framework is the market but the heart is the dealers you get to know. I really enjoyed the read. Brimfield is on my bucket list and I really liked getting the back-story on the place.